The Sendera Draft Horse is a medium sized draft horse built for riding and light carriage work. These horses are of quiet mind and, while docile-natured, are neither slow nor dull in their actions. They exemplify the best of both the gentle giant draft horse and the quality light riding horse. 15.2 h.h. to 16.2 h.h., but height should not disqualify an otherwise good example of type. The head should be no longer than the length of the scapula, with a noble bearing and a flat or slightly convex profile. Eyes should be large, well set, and kindly in expression. The ears should be proportionate to large, and should be finely shaped. The neck should be long but proportionate, measuring 1.3 to 1.5 times the length of the head as measured from poll to muzzle (head) and poll to the point of the withers (neck). The shoulders should be sloping, deep, and muscular. The angle of the shoulder should be between 45 and 48 degrees from the horizontal, as measured from the point of shoulder to the withers. The body should be wide and deep. The back should be of moderate length in proportion to the overall size of the horse, and should be strong with muscular loins. The quarters should be level, powerful, long, and oval. The tail should spring well from the quarters, and should be set neither high nor low. The back should be approximately 35% of the horse's total body length, with ranges from 33% to 40% currently seen in the breed. The hip should fall at a more shallow angle than the shoulder, and when measured from the wing of the pelvis to the point of buttocks should be equivalent to the length of the scapula. Arms, thighs, and gaskins should be muscular. 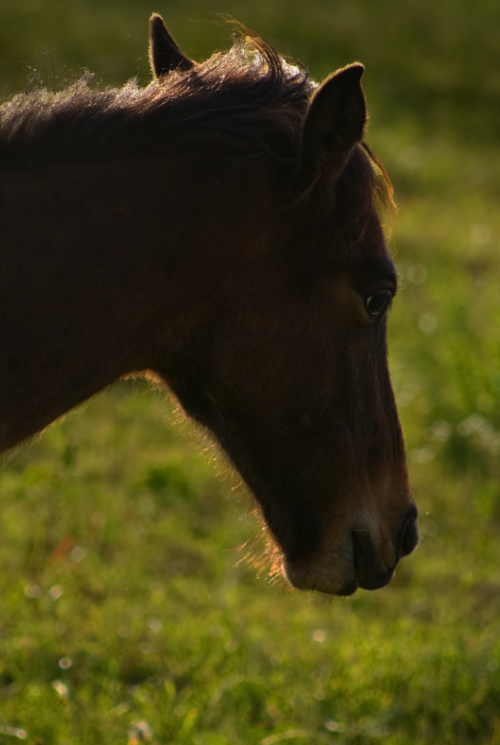 The forelegs should be between 1.2 and 1.3 times the depth of the horse's body, as measured from withers to elbow and from elbow to the hairline of the hoof. The hind legs should be between 1.3 and 1.5 times the depth of the hip, as measured from the point of croup to the stifle and from the stifle to the hairline at the hoof. The lower legs should be dry and tight, without excessive padding or skin. The knees and hocks should be large and well closed. There should be 7" upwards of good flat bone below the knee measured at the nearest point on a tight tape. The pasterns should be strong and sloping. The pasterns should be approximately 33% of the length of the cannon bone, and at an angle matching that of the horse's shoulder. Longer hair along the back of the leg, from knee to hoof, is permitted; the absence of such hair is not a defect and should not be penalized. The ideal Sendera Draft should not have long hair across the front of the leg from knee to hoof, nor should any long hair from knee to hoof be long enough to hide the hoof. Hooves should be large, well balanced to the size of bone in the leg, and have an angle complementary to the angle of pastern. Hooves can be either dark, light, or a combination of dark and light pigmented. Feet that are shallow or narrow are undesirable. Action must be true, straight, and free. High action is not characteristic of the breed, but expressive motion is desired. The horse will move freely from the shoulder and will flex his knees and hocks sufficiently. The action should be ground-covering and have some degree of suspension. Any base color is accepted. Leopard complex (LP) characteristics - striped hooves, mottled skin, or white sclera around the eye - and spotted patterns are common and encouraged, but absence of these spots or characteristics should not be penalized. While the SDHR prohibits pinto patterns, there is no rule governing the expression of white markings; pinto patterning is determined by genetic testing and should not be judged in the show ring. Prohibited genes are listed in the SDHR genetic testing policy.